One of the youngest NBA franchises, the Toronto Raptors were founded in 1995 as part of the league’s expansion in Canada. They struggled in the first few years of their existence as most expansion teams do but they quickly turned their fortunes around in 1998. It was because they acquired Vince Carter via a draft day trade with the Golden State Warriors in exchange for Antawn Jamison. Carter was the first superstar for the Raptors and he changed the culture of basketball in Canada, inspiring some of the NBA’s best players from the North today. After Carter’s tumultuous exit from the Raptors, the team was stuck in limbo until Chris Bosh blossomed into an All-Star. Bosh also left Toronto acrimoniously to join LeBron James and Dwyane Wade and LeBron James in Miami. 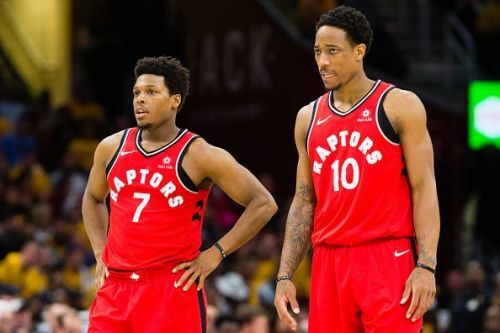 The best was yet to come for the Raptors as the duo of DeMar DeRozan and Kyle Lowry helped the team become perennial contenders in the Eastern Conference. Now, the Raptors are in the Kawhi Leonard Era. But nevertheless, the Raptors have produced a handful of great players in their 24-year existence. Here are the team’s all-time starting five. With only a few options at the center position, Jonas Valanciunas gets the nod over Antonio Davis. Valanciunas has played more games for the Raptors than Davis and he is already in the top ten of the Raptors’ leaderboard. The Lithuanian ranks second in rebounds and third in blocks, possibly getting the top spot if he stays in Toronto for the rest of his career. 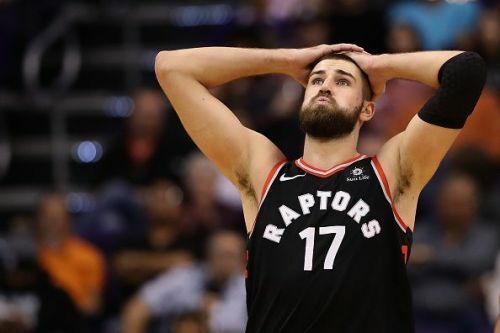 Even though he has not fulfilled his All-Star potential, Valanciunas has been a good player and key in the Raptors offense. He has adapted his game in the modern NBA and he is being used correctly in the past couple of seasons. If he continues his career with the Raptors, his No. 17 jersey could be hanging from the rafters after his retirement. Named an All-Star in 2001 as part of the Raptors, Antonio Davis had his best years in Toronto. He was an important part of the early 2000s Raptors as the team’s leader. The team made the playoffs three times during Davis’ four-and-a-half-year stint.